September is a favorite month at our Merced dentist office. For one, the children are heading back to school and the excitement for a new school year is fun to hear about. For another, we recognize Dental Implant Awareness Month; a topic near and dear to our hearts. We know that dental implants provide our patients with some amazing benefits. 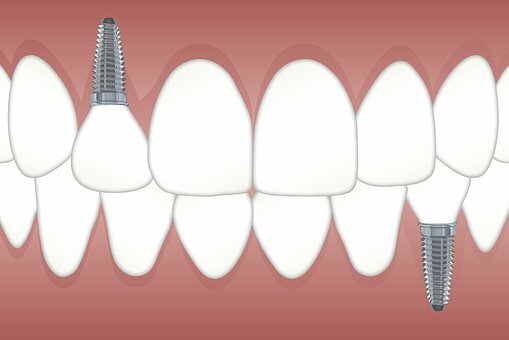 We hope that by educating people on implants, they’ll realize how easily they can reverse a not-so-great-looking smile. A dental implant is an apparatus that replaces a tooth using synthetic materials that are designed to look like the missing tooth. A post is used as an anchor for the crown which shows above the gum line. The crown is designed to match the enamel of your teeth, though metal alloy versions are available as well. Typically, patients find they prefer the enamel-colored crown best as it matches their existing teeth and doesn’t stand out. Dental implants aren’t just for restoring your smile; they actually are quite useful. If you are missing a permanent tooth, your other teeth which once found support by abutting up next to that tooth now have space to move. This causes your bite to change which can make it difficult to chew and thus, cause jaw pain. Additionally, since the teeth start to move, it exposes more of the tooth’s surface to the potential of tooth decay. It has been studied for years, and the results are always similar; your smile affects your emotions. If you are proud of your smile, you’ll have greater self-confidence and self-esteem. This will correspond to your emotions as well. The happier you are with your smile, the more you’ll enjoy social situations and time with peers and co-workers. Dental implants can restore smiles so that you’ll no longer need to be down about your appearance. A great smile goes a long way and makes people feel welcome and interesting. Talk with our Merced dentist about how a good smile can change improve your mental health along with your oral health. If your smile needs a bit of an improvement, call our Merced dentist office today to see if dental implants are right for you. We’d love to share our knowledge with you to see if an implant would work for your smile. Other cosmetic and restorative dental services are listed throughout our Facebook page as well if implants aren’t for you. Take a moment to see how our procedures build great, lasting smiles and reach out to us with any questions you have. Together we can create a wonderful smile for you.